I once asked a gasshuku veteran what he liked best about these training camps. “Bureiko,” he said—a word that refers to an informal get-together, a time when rank and position are laid aside as much as possible and people who enjoy karate gather for a good time. Maybe that’s why we rarely hear of gasshuku in this country: Perhaps here, where rank and title is a big deal, martial artists are more comfortable with seminars and their boot-camp mentality. Too bad. Sleeping bags, campfire cooking and the inevitable 3 a.m. rainstorm are par for the course at gasshuku. So are budding friendships, fond memories and the camaraderie of shared hardship. As far as I know, no one has ever issued a certificate for attendance to a gasshuku. And because everyone is expected to participate in the training and in the chores, a lot of the big-name masters might not be around. But we could do with a few more gasshuku. Let us have a universal spirit that loves and protects all creation and helps all things grow and develop. To unify mind and body and to become one with the universe is the ultimate purpose of my study. I am not an expert. I don't have decades of experience. If you're looking for information on techniques and someone with a vast martial arts background, the best I can say is, "Hey, I know some of them." I'm just a student that has been regularly coming to class for a number of years. If you're going to start following this blog, you'll be following me on a journey. Your comments are welcome. If you're in our area, visit our dojo. 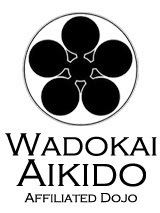 The only way to learn Aikido is to participate.